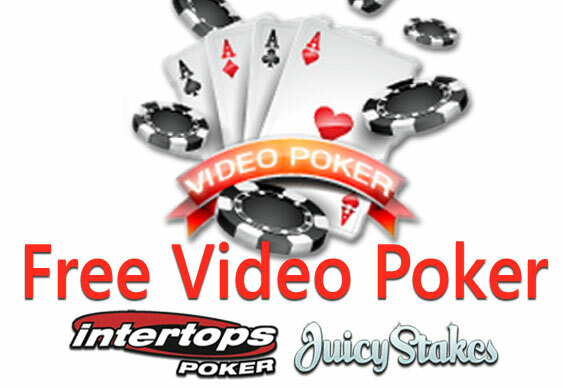 We don't usually mention video poker here at Bluff Towers but we'll make an exception as there are some tasty freebies on offer from Juicy Stakes and Intertops Poker. Players at the Revolution Network sites can grab 20 free video poker hands worth $0.25 apiece between now and 26 August. “This offer gives online poker players a chance to see what they think of video poker for free,” said the casino manager at Intertops Poker. Play any video poker game, get $.25 free bet on each line. There's plenty on offer for traditional poker players at both sites at the moment. In addition to the usual offering of cash and tournament action, both Intertops and Juicy Stakes are running satellites to the TKPT event in beautiful St Maarten in the Caribbean in November. Packages worth $2,700 will be awarded with qualifiers starting from just $1.10.